I have been working on a night shift for last five years. And sleeping during daytime is not as relaxing as we sleep at night. But to my surprise, I slept continuous 8 hours in last two days (it rarely happens)! and it was really kinda achievement for me. Very much relaxing and refreshing! After a very long time, I got this much long sleep (without any interruption). Today, I’ll write Quick tutorial on how to add custom notification message on shopify checkout. We’ll add two notifications, first one will remain visible all the time on shipping address page and second one will appear if customer select shipping country other than “United States”. Step 1: Go to Shopify Admin Panel. Under Sales Channel, Click on “Online Store” and after go to “Preferences” page. Step 3: Paste this code in the script box. Now, Just save and then test. Firing/Letting someone go is one of the most difficult decisions for management. Today I sent a goodbye email to one of our developers. I tried to be very much polite and positive and also explained about the reason of this difficult decision. Every weekend I am planning to write some open source code snippets for Shopify platform. Today I’ll be demonstrating how to create Donation product in shopify which will have option to add desired donation amount. To accomplish this we’ll create a donation product with different variants (with single option “Amount”) each variant will have different price. And we’ll create a product template product.donation.liquid and assign this template to the newly created product. and we’ll make small changes to cart page template (to hide quantity selector and price option for variant). Step 2: Create a new product template (product.donation.liquid) and then assign it to newly created product. and then replace the above code with this one. Above code will try to match “other” variant every time a variant is changed. And if its found then it will show up a text box to enter the desired amount. Step 5: Now put this js code under document ready function. This code will update the pricing and quantity box. “Other Variant” has pricing as 1. So when someone will enter desired amount, we’ll update the product quantity and also show the price. Step 6 (optional): If you want to hide your quantity and donation product price on cart page then follow this step. Try to locate this code in cart.liquid template. And thats it. Now you can test. If you find any issue, please leave a comment. 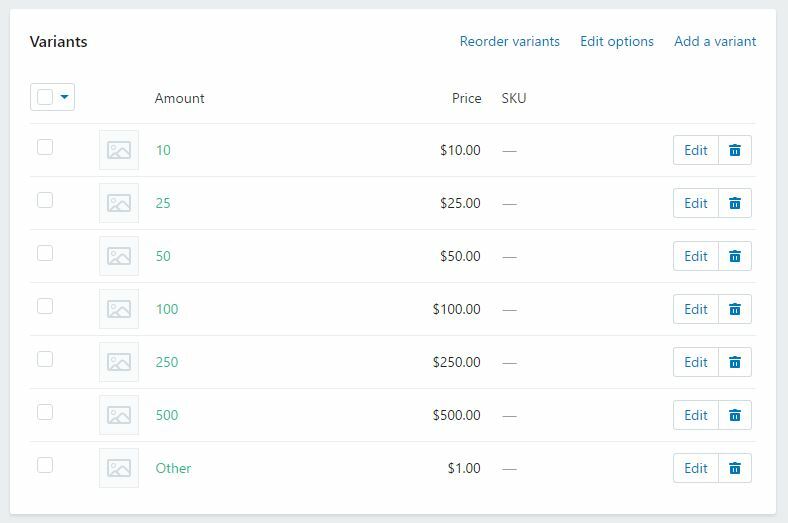 Few days ago I was working on a Shopify project and I made some customization in the liquid files to add quantity limiter (to variants). Currently I have setup this only for “Maximum” quantity (i.e. customer can not purchase product/variants more than the defined limit). I believe there are some application available for this purpose but this functionality can be easily achieved without using any paid app. This product has different sizes and you can find the max quantity allowed for each variant in the product description section. This product has multiple variants (Size, Leg) and you can find the max quantity allowed for each variant combination in the product description section. On my sandbox account, I am using Shopify Timber Theme and Metafields Editor (Free App) to add limit for each variant. Step 3: At the bottom of product.liquid. Please add this code. And Thats it. You’re done!! Now you can test. Cart Limiter should work. If you find any problem then please leave a comment or email me.